Fix Toolbox, internationally known for its growing portfolio of award-winning data recovery tools for the most popular applications and database formats, is pleased to announce the release of the considerably improved version of Exchange Server Fix Tool, a powerful, easy-to-use and convenient Exchange database fix program for all categories of users, from complete novices to IT professionals. 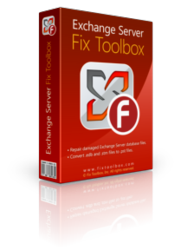 Fix Toolbox, a software development company known for its growing family of high-quality file repair and data recovery solutions, is pleased to announce the availability of Exchange Server Fix Tool, one of the company’s most successful products. The software enables users to recover all kinds of data from damaged *.edb and *.stm files and save them as separate files on the hard drive or as a PST file that can be added to Outlook with a few clicks. This Exchange database fix program repairs databases of Microsoft Exchange Server 2000, 2003, 2007 and 2010 formats and recovers all standard objects found in these files, including messages, contacts, calendar entries and tasks. The product uses a convenient step-by-step recovery wizard that guides the user through the process and minimizes the chance of a human error. The newest version of this Exchange database fix program is based on a largely updated database analysis engine that works with Exchange files of any size and handles the most serious cases of database corruption. Exchange Server Fix Toolbox comes with an integrated database viewer that lets users view a list of recoverable items and mark specific ones for recovery. “We are very pleased to offer corporate users an all-on-one solution for fast and intuitive recovery of data from Exchange files. Loss of business-critical information is always a problem, so we do our best to minimize the adverse effect of data corruption on our clients’ businesses,” explains Boris Bobrov, Senior Product Manager at Fix Toolbox.